Marshall M. Fredericks Sculpture Museum | Front view of "Two Sisters Fountain"
Front view of "Two Sisters Fountain"
It was not until 1965 when Cranbrook Board of Trustees member Robert Grindley decided that the sculpture would be an appropriate memorial for his wife that the bronze casting of the figures was completed. His two daughters attended Kingswood School, thus the title Two Sisters. The bronze sculpture stands at the entrance to Kingswood School. 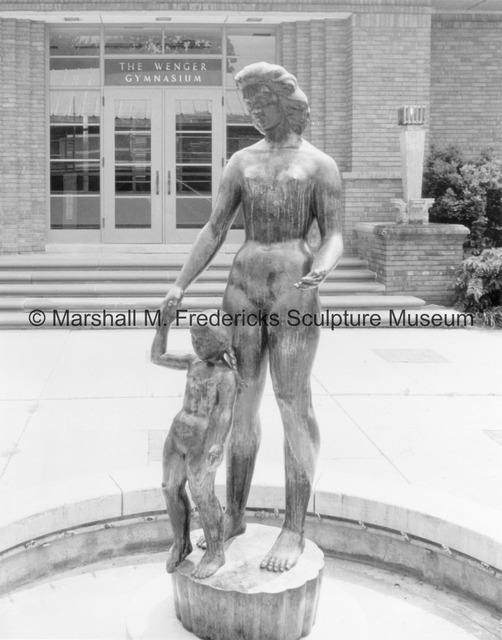 “Front view of "Two Sisters Fountain",” Marshall M. Fredericks Sculpture Museum, accessed April 26, 2019, http://omeka.svsu.edu/items/show/3661.